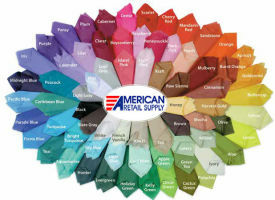 American Retail Supply offers more than 400 stock varieties of Gift Wrap Color Tissue Paper, Printed Tissue Paper and varieties of Natural Kraft and White Tissue Paper. If you are a Retail Store owner or E-commerce Online Business and looking to differentiate yourselves and build brand equity, we highly recommend using colored Tissue Paper in your packaging to the customers. It provides for great shopping experience and brand association, when customers shop from you. We offer large varieties tissue paper such as Solid Color Tissue Paper, Pearlesence Tissue Paper, Gemstones Patterned Tissue Paper, Botanical Printed Tissue Paper, Precious Metal Colored Tissue Paper, Animal Printed Tissue Paper, Polka Dots Tissue Paper etc. Our Service Specialists are highly experienced to develop Custom Tissue Paper. We specialize in doing Custom on different kinds of tissue papers, and in doing from small to very large quantities for your store. Custom Tissue Paper is great economical tool to build your brand that goes long way with your customers. You can easily get your name or logo printed in the color of your choice on Custom Tissue Paper. One of our most popular offering is brown kraft tissue paper and white tissue paper. One of the industryâ€™s best and leading tissue paper in its category, our brown & white tissue paper has 50% Post-Industrial waste and 10% post consumer waste, and manufactured in neutral PH balanced eco-system. You can view consistent fibers in our tissue paper, while holding up the tissue paper. The white tissue paper has versatile use and can be used for packing, gift wrapping, crafty projects, storing certain collectibles and many other uses. Colored tissue paper comes in 70+ gorgeous shades and size options. The bright colors are perfect for crafting projects, and the paper is easy to flex, shape, fold, glue, and manipulate into whatever youâ€™d like. It can even be used to make beautiful paper pinatas! No matter what your business or lifestyle, gift wrap colored tissue paper is a good thing to have on hand. American Retail Supply has more than 150 designs for gift wrap printed tissue paper. If you are not looking for custom printed tissue paper, and still want great design for your gift wrapping, you can chose from selected designs and create theme gift wrapping and packaging. Some of our popular gift wrap tissue paper designs are old and classy gold/ silver printed patterns tissue paper, gemstones, western theme printed tissue paper, polka dot tissue paper, floral tissue paper, and animal print tissue paper. Most of the printed gift wrap tissue paper comes in packs of 200 sheets per pack. American Retail Supply offers from lightweight to heavy food service tissue paper. You can build your brand and promote your business with customized FDA approved food service tissue perfect for so many applications such as sandwich wraps, basket/tray liners, bakery tissue etc. Use custom food safe papers to line take-out boxes or to-go boxes to reinforce your brand! Choose from our in-stock Food Service Dry Waxed Tissue or let us custom manufacture a custom printed tissue that is unique with your colors and store branding. Even if you donâ€™t find the design on our site that perfectly matches your need, our sales representative are happy to help you. Call American Retail Supply if you have any questions or need assistance in placing an order for tissue papers 1-800-426-5708.